The most common symptoms of Asthma are wheezing sounds while breathing and difficulty in breathing which is caused by the shrinkage and inflammation of respiratory tract. Actually, air travels from our nostrils to lungs through small bronchial air passages that end into the lungs. When these bronchial air passages are inflamed, obstructed or tightened because of the spasm in surrounding muscles, the difficulty in breathing is observed in patient. This condition is called Asthma. It is observed that 50% of Asthma patients are children of ages under 10 because they have very narrow air passages. If you observe that your child has difficulty in breathing consult your physician ASAP OR this condition may become severe or chronic. 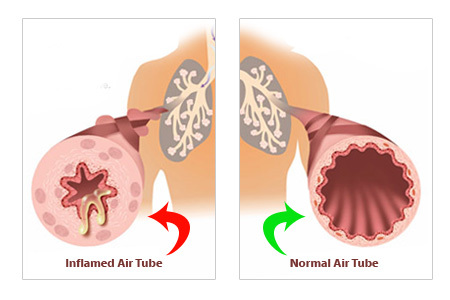 Asthma is caused by shrinkage of air passages. Hereditary Reason: It means that if parents have this disease then it may be transferred to their children. Allergy: Allergy to some substances may trigger the Asthma problem. Common allergic substances include pollen, cockroaches, dander of animals and dust mites. Infection: Viral Infection in respiratory tract. Depression: Stress or Anxiety may trigger an Asthma attack. Medicines: In some patients using some specific medicines can also cause or trigger Asthma symptoms. Examples are beta blockers, aspirin or sulfites. How Asthma Treatment is Done In Allopathy and Is It 100% Curable? Please note that there is no complete treatment of Asthma in Allopathy. All medicines for Asthma treatment are only given to reduce or minimize the symptoms. The main affect of Allopathy medicines is to expand the air passages that helps patients to breath with ease. But this is only temporary relief and does not eliminate the root cause of problem. So, we can say that 100% Cure of Asthma is not possible in Allopathic treatment. Is 100% Cure of Asthma Possible in Homeopathy? Unlike Allopathy, 100% cure of Asthma is possible in Homeopathy. This is good news to Asthma patients who are taking Allopathic medicines for years but have not seen any permanent relief yet. How Treatment of Asthma is Done in Homeopathy? Homeopathic medicines give quick relief by reducing the constriction of air passages. If main reason of Asthma is allergy then medicines are given to increase resistance against allergens. Immune system of patient is improved by medicines that increases the ability to resist against Asthma creating substances. Special medicines are given that stop the recurrent colds and infections in lungs and air passages. If Asthma condition is Hereditary in some patients then specific medicines are given to treat these cases which not only cures the diseases but further delivery to next generations is stopped. So, Homeopathic medicines eliminate the root cause of Asthma problem which gives permanent relief to patients when proper and complete treatment is done. iam an asthemathic patient since childhood.Homeopathic medicines give quick relief by reducing the constriction of air passages.i have consulted dr sabeel to cure this problem..he had given Special medicines that stop the recurrent colds and infections in lungs and air passages..Now i dont require even inhailer the results of homeopathy treatments are remarkable.. I am living out of Pakistan but i have 6 years old kid that suffer from ashtma, how can i get it?